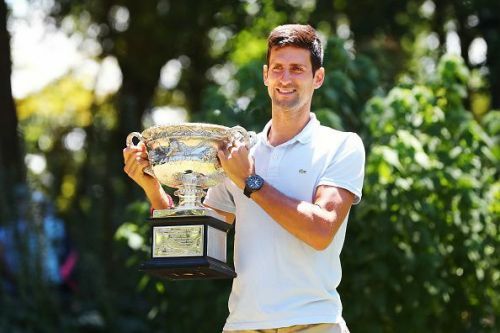 Novak Djokovic wrote another chapter in the history books on Sunday when he beat Rafael Nadal 6-3, 6-2, 6-3 in the final of the 2019 Australian Open. With this victory, Djokovic became the only man to have won the Australian Open title seven times. Djokovic is most certainly the undisputed king of Rod Laver Arena. The Serb was on fire on Sunday; the fact that he faced only one break point in the entire match tells you all you need to know about the level at which he was playing. Nadal had no answers. He was simply outplayed by some spectacular play from the other side of the net. Djokovic seems to have mastered the three D's - Determination, Dedication and Desire - that are necessary for any individual to be successful. It is simply astonishing to see what the Serb has achieved in the past 6 months. It was exactly 12 months ago that Djokovic had to undergo a major surgery, which resulted in a slight dip in his game. But as champions tend to do, the tenacious Serb came back more powerful than ever. The fact that he is now holding three Majors and has a chance to win all four at the same time, for the second time in his career, is proof enough of the greatness of the Serb. Roger Federer, who has 20 Grand Slams to his name, leads the race. He is followed by Nadal, who has won 17 Grand Slam titles. With this Australian Open victory, Djokovic has surpassed Pete Sampras's 14 Majors and is now third in the list with 15. The obvious answer to that question would be (and rightly as it should be) the French Open. Djokovic will not only be looking to complete the 'Nole Slam' at Roland Garros, but also be trying to become the only man in the Open Era to win all Majors at least twice, which should give him added incentive. But that's far ahead. We still have the rest of the hardcourt season in front of us before the clay season starts. I think Djokovic would love to win the Indian Wells and Miami titles and complete what is called the 'Sunshine Double' for a record fifth time. He did manage to achieve that feat in 2011, 2014, 2015 and 2016. All in all, a lot is at stake for the Big 3 over the rest of the season, and we are assured of a great rivalry between these three gladiators of our sport. But in the meantime, let's just celebrate Djokovic's incredible run at the 2019 Australian Open. Let the race for GOAT begin! Is Novak Djokovic on the verge of achieving invincibility? Djokovic or Nadal: Who is the favourite at the 2019 French Open?